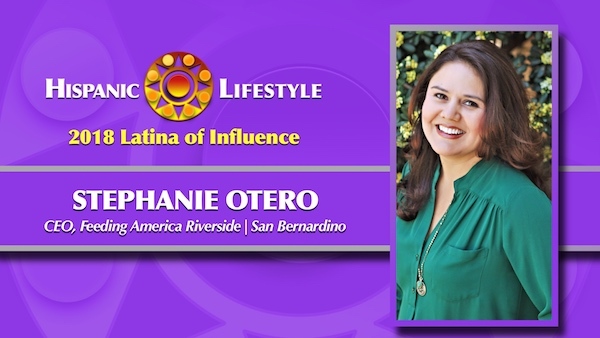 Hispanic Lifestyle is pleased to recognize Chief Executive Officer (CEO) of Feeding America Riverside | San Bernardino Stephanie Otero as a 2018 Latina of Influence. Ms. Otero along with our entire list of 2018 Latinas of Influence are invited to participate in Hispanic Lifestyle’s 2018 Latina Conference taking place April 4 and 5, 2018 in Ontario, California. Stephanie Otero is no stranger to hard work, perseverance, and determination. Stephanie was raised in a small, predominantly white, agricultural/farming community in eastern New Mexico, where teenage pregnancy, drugs, and a less than 60% high school graduation rate were the norm. Add to that, a household with alcoholism and poverty, and it’s clear that Stephanie’s accomplishments are an act of her character, strength, and determination. Focusing on her studies, Stephanie earned a scholarship to the University of New Mexico, where she pursued a degree in Accounting & Finance. Since the age of 16, Stephanie has worked full- time, including the duration of her time as a college student. While in college, she soon married and moved to San Diego, CA where she eventually earned a BS Degree in Accountancy. After earning her college degree, Stephanie worked on obtaining the highest credential that can be achieved in the Accounting industry, a Certified Public Accountant. Earning scores as high as 98% on the CPA exams, Stephanie earned her CPA license in California and begin practicing public accounting. When Stephanie and her husband decided to start a family, Stephanie knew she needed more flexibility and a better work-life balance, which led her to start her own CPA practice in Palm Desert, CA. With a baby on her lap, no clients of her own, and no experience running a business, Stephanie pounded the pavement, networked, and started volunteering for nonprofit organizations, like the Girl Scouts and Martha’s Village and Kitchen. In just one year’s time, Stephanie had an actual office, employees, and was grossing over $150k in revenue. She ran a successful CPA firm for over 13 years in Palm Desert, CA that specialized in nonprofit organizations. She was awarded the Athena Leadership Award in 2011. In 2013, Stephanie closed her practice when her husband was transferred and her family moved to the Inland Empire. Once living in the Inland Empire, Stephanie knew that she wanted to give back and be of service. She collaborated with other women entrepreneurs, which eventually led to her co-authoring a book, “Navigating Entrepreneurship”, which is a sort of “what not to do” guide for budding entrepreneurs. In addition, Stephanie started volunteering her time by speaking at women’s leadership conferences and organizations, and teaching classes on Quickbooks, leadership skills, and business finance. This eventually led Stephanie to becoming a Certified Business Coach, where she counseled business owners and entrepreneurs. Still seeking more, Stephanie saw an advertisement for a local nonprofit that was seeking a “part- time CFO”. Although the pay was a fraction of what Stephanie was used to and was more than a 45 minute commute from her home, Stephanie felt compelled to take the position. This nonprofit turned out to be Feeding America Riverside | San Bernardino (“FARSB”), the food bank of the Inland Empire that feeds more than 400,000 people each month. It didn’t take long before the mission of FARSB, ending hunger in the IE, became Stephanie’s personal mission. Having not even served a full year as CFO, Stephanie was soon promoted to CEO of FARSB. As CEO of FARSB, Stephanie works tirelessly day-in and day-out to provide, what she believes every human being should have access to, food. Under her stewardship, FARSB has focused on long-term financial health, stability, expansion of programs, and sustainability. She looks forward to a future where no person in the IE is hungry, and eventually, no person in the world is hungry. Stephanie has persevered and committed herself to a better a future, for not only herself and those around her, but her community. She is a true testament that despite our odds, our predicaments, or our surroundings, we each have the ability to be better and to do better.